The University of Tasmania Sandy Bay campus is just 20 minutes’ walk from Hobart’s CBD and waterfront cultural hub. We overlook the Derwent Estuary and nestle under the distinctive Organ Pipes of Mt Wellington. Our planning program maintains a focus on sustainability, and is part of the discipline of Geography and Spatial Sciences. 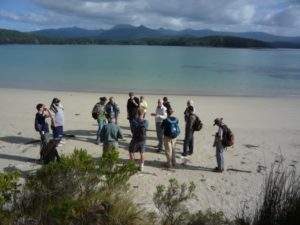 Tasmania provides a unique socio-natural laboratory in which to educate the next generation of urban, regional, strategic, and statutory planners. In preparation for ANZAPS 2017 we were thinking about Hobart’s location – where we are in the world in terms of key trends. We welcomed papers on diverse planning and allied topics, only asking that speakers locate their planning research, training and practice. This location may be within a specific place, in relation to social, economic or political trends (big or small), within the planning literature, or within the broad activities of the planning profession.